Refined corn products, including many derivatives of sweeteners, starches, and corn oil, have been a mainstay of the American diet for over a century. CRA members have enjoyed a long history of producing safe, quality, and wholesome food ingredients. With the passage and implementation of the U.S. Food and Drug Administration’s (FDA) landmark Food Safety Modernization Act (FSMA), CRA members meet or exceed the current Good Manufacturing Practice (CGMP) standards and constantly update their practices to ensure safe ingredients. CRA members also work closely with their customers to ensure compliance with their requirements for high quality products. Member production facilities are frequently audited by customers and FDA officials to ensure that all quality and food safety standards are met. Refined corn products are considered some of the safest human food ingredient products available today, with a long track record of no FDA mandated recalls. These ingredients provide the nutritional fiber, protein, and carbohydrates needed for growth and energy, while also making foods more palatable and enjoyable. CRA member attention to product safety and quality in everything they do ensures their products provide healthful and cost-effective food ingredients for everyone to enjoy. 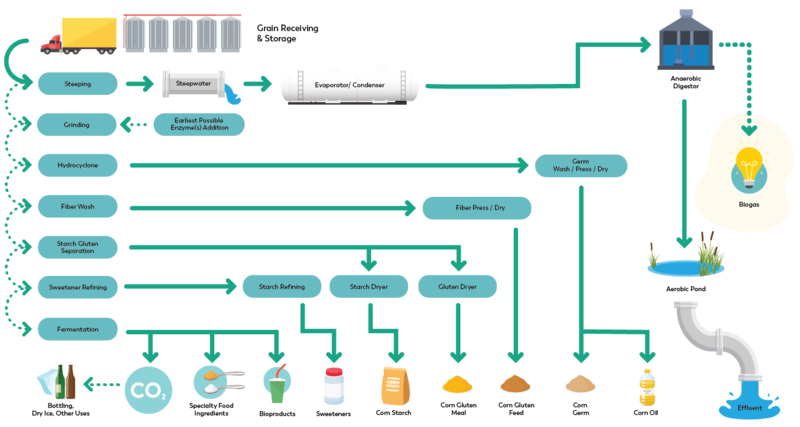 How do corn wet mill refining companies obtain corn to produce human food and animal feed products? Corn can be purchased and delivered directly from a farm or purchased from a county storage elevator. The elevators may co-mingle and store corn delivered to them from multiple farms. Corn arrives at the corn processing plants by truck, rail, and river barges. How is the quality of the raw corn guaranteed? Corn is graded according to federal standards established by the U.S. Department of Agriculture’s (USDA) Grain Inspection, Packing and Stockyards Administration (GIPSA). Corn purchased by the wet mill is transported to the processing facility in compliance with U.S. Food and Drug Administration (FDA) regulations for raw agricultural commodities. Once received at the processing plant, the whole kernel corn is inspected and screened to remove any foreign material, and additional tests may be conducted with respect to genetic modifications or other contaminants contained in or on the corn kernels. More information about GIPSA standards can be found here: https://www.gipsa.usda.gov/fgis/usstandards.aspx. How is corn “wet milled” to produce the variety of products used for food and feed? In comparison to a “dry milling” operation, the corn is first steeped in a slightly acidic water solution containing a small, safe amount of dissolved sulfur dioxide. This solution loosens the outside hull of the corn to permit easier separation of the starch, protein, germ, and oil components. The steep water will contain small amounts of nutrients from the corn, and this is recycled to be combined with various animal feed materials. The de-hulled corn is then separated into bran, starch, and germ fractions. The starch itself is a polymer of glucose sugar molecules and is used to produce a number of starch products with varying properties (e.g. regular corn starch or modified starch used for thickeners and emulsifiers). Alternatively, the starch may be partially hydrolyzed to produce syrups of varying sweetness levels (e.g. pancake syrup). Starch that has been fully hydrolyzed to its component glucose sugars can be sold as-is, or it may be converted by natural enzymes into a glucose and fructose simple sugar mixture known as High Fructose Corn Syrup (HFCS). Corn fractions not used for human food production are combined and used for animal feed. The entire process used for food and feed production is highly efficient, and over 99 percent of the corn kernel is used. How is the quality and safety of corn wet milled products maintained? The corn wet milling industry has been in practice for over one hundred years. Equipment and methods have been improved during this time. Facilities have Quality Assurance laboratories and trained personnel on site, and strict procedures and specifications are in place. In addition, most wet milled corn products have been used in foods for many years, and these products are subject to U.S. and international standards for quality. Where can I find specifications for corn wet milled products? Each company can provide a technical data sheet containing the characteristics of their specific products. These sheets are often available on their respective websites. Most wet milled products are produced in compliance with specifications listed in the U.S. Code of Federal Regulations (CFR) under Title 21, or specifications may be found in the Food Chemicals Codex, the U.S. Pharmacopoeia, or the U.N. CODEX organization. Select engineering properties data can be found on the CRA website. Where can I find information on analytical methods used for quality determinations? The CRA maintains a list of validated procedures recommended for use in determining corn product compositional quality. These are found on the and are available for download. Additionally, the CRA maintains an annual Carbohydrate Check Sample Program (CCSP) to ensure that individual laboratories are conducting their tests consistently. Information on the CCSP can be found on CRACheckSample.org. How are corn wet milled products regulated? As with any food ingredient, the U.S. Food and Drug Administration (FDA) regulates corn wet milled products. Starches, syrups, corn oil, and other derived food ingredients are governed by Generally Recognized as Safe (GRAS) or Food Additive regulations typically found in Title 21 of the Code of Federal Regulations (21 CFR). All food materials are produced in compliance with current Good Manufacturing Practice (cGMP) regulations listed in Title 21 CFR in section 117. Additionally, products are produced in compliance with the Food Safety Modernization Act of 2011 (FSMA). Products shipped internationally also comply with laws and regulations governing those markets. For animal feed, products are regulated by the FDA Center for Veterinary Medicine and by the American Association of Feed Control Officials (AAFCO), a state regulators’ body. Are corn wet milled products covered by the Food Safety Modernization Act of 2011 (FSMA)? Yes. As human and animal food ingredients, corn wet milled ingredients are subject to FSMA regulations. FSMA modernized FDA’s existing food safety regulations by updating the Good Manufacturing Practices standards, and established regulations covering: Inspections and audits; preventive controls for maintaining food safety; supply chain and recall management; food material traceability; foreign supplier verification; and controls against intentional adulteration of products. Details of these sweeping regulations can be found on the FDA website here. What procedures are in place to comply with the FSMA? First, corn wet mills are subject to inspection by the FDA and by state officials. The FDA considers corn wet milled products to be of low risk compared to high risk products like fresh cut vegetables, fruits, and seafood. Consequently, FDA inspections are less frequent, but other FSMA requirements result in multiple customer audits annually of each corn wet mill. These audits check for required food safety procedures and include audits of established food safety plans, traceability, adequacy of raw material supplier pre-requisite programs, Hazard Analysis at Critical Control Point (HACCP) plans for preventive controls, compliance with validate process control parameters, final product testing, and the company’s results from supply chain audits. A series of food safety White Papers addressing various product safety concerns can be found on the CRA website. Have there been major recalls of corn wet milled ingredient products due to food safety issues? No. The corn wet milling industry has enjoyed a decades-long history of producing safe food ingredients, and these ingredients are found in many common consumer food products. Many serious food recalls occur due to pathogenic microbial contamination like Salmonella and E. coli. Has the safety risk for microbial contamination been assessed? Yes. The wet milling industry has conducted a thorough assessment of the potential for pathogenic microorganism contamination. A White Paper on this subject can be found in the food safety White Paper section on the CRA website. Overall, the risk for pathogen contamination is very low and is controlled due to the elevated temperatures, pH, and concentration (e.g. water activity) of the production process. What are mycotoxins and can they be found in corn wet milled ingredients? Mycotoxins are small molecules produced by specific pathogenic bacteria and fungi which can grow on various field crops under specific, usually adverse, conditions. Mycotoxins can be found in many cereal grains, including corn, wheat, barley, rice, and others. Some mycotoxins are water soluble and others are oil soluble. The FDA has established upper limits and guidance on levels that would be considered safe to consume. Corn wet milled products comply with these FDA standards. The CRA website contains a White Paper on mycotoxin presence in input corn and the control of potential contamination in wet milled products. What other potential contaminants found in food products are controlled for? The well-defined and controlled processing of wet milled products ensures compliance with contaminant safety standards set by the FDA. Because corn products are obtained from field-grown, raw agricultural commodities, there is potential for very low levels of contaminants to be present in the corn kernel. These contaminants include heavy metals like lead, pesticide residues, foreign matter, and certain chemical contaminants. Corn wet mill processing procedures remove these contaminants to meet FDA safe-level regulations. Product testing verifies removal. See CRA’s Food Safety White Papers for more detail on specific contaminants. Where can I find more information on corn processing and derived products? The CRA website contains information on our industry, its practices and products. Additionally, a number of reference books are available. Corn wet milled products have been produced for over one hundred years, so there is a great amount of information available, particularly on starch and sweetener production.